Enjoy a romantic moon rise over the mountains and lake while sitting by a campfire with a drink and your loved one(s)! What could be better? Located just a few feet from the lake,it has everything one would need to enjoy a stay in the Rangeley Lakes area. The first floor consists of a living area with a gas viewing stove and large windows with window seats that open out towards the lake and a bedroom with a queen size log bed. There is a deck on the rear with a gas grill and table set. 2 Kayaks, water floats and a canoe are available at no cost. 2 built in single beds (built in with reading lamps) and a double complete the loft. The yard is large enough for games (we have boccie and badminton on hand). We are within walking distance to restaurants, groceries, ice cream shop, boat rentals, tennis, plus hiking trails; and only a few miles from the quaint town of Rangeley, and Saddleback Ski Area. The kitchen is fully equipped with a dishwasher, ice maker and gas cook stove, bath also serves as a laundry with front load washer and dryer. 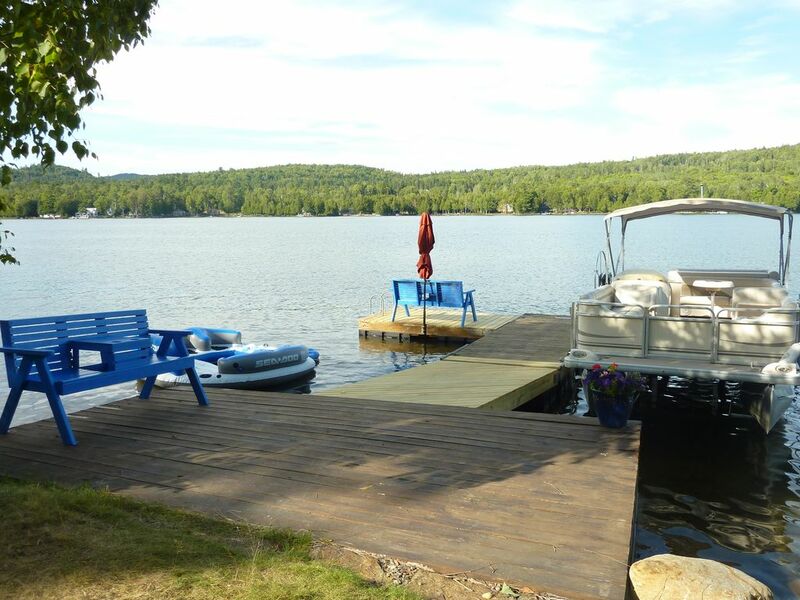 There is a floating dock with a swim area and plenty of room to tie up your boat. The natural beauty and wildlife are abundant. Wildlife spotting trips are a favorite pastime either by car or kayak. Listen to the loons at night under a star filled sky; away from light pollution, it amazing! Relax, get away from it all, put your feet up or get them to take you up Bald Mountain Trail. The view is incredible! This cabin is perfect for a couple, or groups (families) of no more than six. We look forward to working with you to provide information about the area and to ensure you have everything you need to make your stay delightfully memorable. Check us out on facebook! The Shire Rangeley Maine. Dock space is available for your boat, trailer storage can be arranged at no cost. Boating/skiing/snowmobiling/ swimming/hunting/fishing/hiking/wildlife viewing is what this area is all about. Snowmobile from your door, swim or sunbathe by the lake, keep the boat handy, what ever your choice, you'll find our cabin clean, comfortable, well stocked and a good value for your money. Have a campfire lakeside, or move the table to dine lakeside as well. This is an escape from the everyday to a world of beauty and serenity. There are ceiling fans up and down, windows placed for utmost privacy. Long term winter rates available. Keywords: Cabin, downhill skiing, cross country skiing, paddle boarding, wake boarding, water skiing, jet skiing, hunting, lake, snowmobiling, kayak, boating, hiking, Saddleback, dock,wildlife, fishing, water frontage, golf, swimming, immaculate, fully equipped, bedding, long term winter, romantic, dock, winter rental, short term, cozy, clean, washer, dryer, pet friendly, stargazing, meteor showers, amature astrology, lunar events, photography, canoeing, relaxing. We call it 'The Shire' because it is green and peaceful, the kids named it after the idealistic area in the Tolkien trilogy! They (now adults) always talk of returning to 'The Shire'; like it's magical name, it is a place one yearns to return to. Originally from R.I. I grew up craving to live in Rangeley, as my family has vacationed here since the 1940's. I have always been in love with the town, the surrounding natural beauty and the activities available in the area. Bob fell in love with it as well, prompting us to buy this unique property. It is an ideal location, with one of the best views on the lake. Close to amenities but yet away from it all. We love to snowmobile, ski, travel, play with our little dogs, attend music festivals and playing games. Campfires are the favorite pastime on summer evenings as well as dinners lakeside, watching the moonrise to the songs of the loons. It is truly magical. After working hard for many years, there was no choice when it came to selecting Rangeley for our second home. It's pristine beauty offers 4 seasons of outdoor fun. It's remote, yet close to hiking trails, snowmobiling, boating, fishing, Rangeley is a very special area, it has so much to offer, beauty, peace, fine dining, outdoor sports and indoor fun as well ( Moose Alley-bowling,pool, darts etc...) for those rainy days. Just the smell of the fresh clean mountain air is enough to make you want to stay; not to mention the view from the property and the wildlife surrounding us. Don't be surprised should you see a moose swimming across the cove, or see a deer leap through the woods. It's always exciting to be visited by our furry friends! Downtown Rangeley has many shops. restaurants, 4 wheeler and snowmobile rentals and bowling. This area is a wildlife heaven. You may see moose, bear, fox, deer etc... we have had moose, bear and deer visit us here at The Shire! Oquossoc is a village in Rangeley. At the corner (.08 miles) you can find most of everyday items you may need. Milk, veggies, takeout, restaurants, post, pizza and sandwiches'. The property is on the lake. From the property you have a great south east view looking all the way down the lake towards Saddleback. Property is 75 feet from waters edge. Listen to the loons on a summer night, take a dip before bed, snowmobile from your door. Mountains surround Rangeley Lake and are visible from the lake front. You may want to xcountry ski or snowshoe out of your door onto Rangeley Lake when frozen securely. xcountry or snowshoe right here on the lake! The cabin is on the water. Basement is heated providing warm floors in winter. Vermont Castings stove heats the house even when it's -30. Comfy quilts, pillows and clean linens provided. Table linens. Hand, dish, face cloths, plenty of all. Has 2 window seats, sofa, large windows looking out at the lake, flat screen, easy chair, throws, pillows. Above range with exhaust fan to outside. Salt, pepper, coffee filters, TP, paper towels, dish detergent, dishwasher detergent, laundry detergent, bathroom cleaner. Enough to get you started, please replace as needed. Table can be extended with leaves, extra folding chairs. High chair upon request. Yard games and board games, cards, cribbage. Deck with table 6 chairs, away from the lake side where it is sheltered from the wind. Dining lakeside is preferable if weather permits. Ski xcountry from your door on the frozen lake or snowshoe. Downhill is close by at Saddleback, xcountry trails as well at the xcountry ski club. Free use of on site kayaks (2) and canoe when available (usually they are waiting for a paddler)! Lake frontage provides an opportunity for x- country skiing or snowmobiling from the door. Swimming is excellent as well as fishing and boating. We also have a Big Mable to tow behind your boat or just float around and other water floats. Lawn games are available as well. Wonderful weekend at The Shire! My husband and I had a wonderful stay at The Shire. A comfortable cottage to kick back and relax. Despite the cold and damp weather, we were still able to get out, scenery and come back to a cozy cottage! Very cozy with a great view from inside the cabin (which was perfect given the chilly temp). Everything was very clean, it was well appointed and the location was excellent. Thank you so much for reviewing The Shire! I think it's so helpful to future guests that may be considering our property. Your opinion matters very much to us! The cabin was nice and cozy. The views were amazing! We loved watching the sunrise and then the moon over the lake. There is a mountain 10 minutes away that looks over all the lakes around the cabin. We also went to a nearby waterfall called angel falls that was stunning. It was a perfect weekend getaway and we wish we could have stayed longer! Thank you! We're so happy that you enjoyed! You were excellent guests and we'd be happy to have you book again. Excellent week long stay at "The Shire"
Wonderful stay and hosts at "The Shire" last week on Rangeley Lake. A great cabin with everything one would need for both short and long term stays. Had some great weather, and a swim during mid September! Definitely looking forward to another stay with Jeannine and Bob next year. Thanks for your hospitality Jeannine and Bob!! Perfect. Beautiful. We never wanted to leave. Our experience was outstanding. The property is perfect...impeccably clean and lovingly maintained for the guests comfort and entertainment with the most friendly and gracious down to earth hosts ! We docked out boat right there. Had our hound welcomed just as we were! Everything we needed was there and more. The lakeside fire...cooking on the grill..having coffee in the early morning mist and wine during sunset or watching the rain...it was all spectacular. Now that we are more familiar with the area we are even more excited to return. Rain did not dampen our stay. We played games and music...and the four us us absolutely fell in love with it all. Your home and property as a get away are part of our future!! Thank you Jeannine and Bob! It was our pleasure! You were wonderful guests! It was fun for us as well! We hope to show you more of the area when you come back! Thanks for such a great review! Lovely, well-designed cabin that is comfortable for multiple generations of family. Very nice dock to tie up the boat, and the beach is perfect for little ones. Great swimming here as well, as water is often calmer than the rest of the lake. Jeannine and Bob are kind hosts. 4 wheeling, Wildlife Tours, Kennebago River Wildlife Viewing Trips, stargazing at our beautiful dark sky free from most light pollution!, Moose watching, The best Fly Fishing and guides in the area available. Dog sledding can also be arranged by appointment. Moose Alley provides entertainment on cold rainy days, lots of fun for adults and kids. Lake tours by boat. Massage therapists are available in town or by booking well ahead they will come to the cabin for a completely relaxing and private experience. Campfire ring, lakeside. There are many concerts and festivals going on throughout the region all summer, check the Rangeley Chamber on line for listings. 1 week reservations only during prime weeks Mid June to Early October. Cancellation policy in brief: 61 days prior, no problem, full refund of deposit and any payments. 60-31 days prior, forfeit 1/2 payment and deposit. 30 days prior, does not warrant any return of funds. However, we are willing to work with our guests! Without making a promise, we will try our best to rent for the time you reserved if you must cancel. If possible we will refund your $$$$ in full if we can rebook! $20.00 per day fee per guest over 4 people. $10.00 per day pet fee.